Owned and operated by the Osoyoos Indian Band, Nk Mip Canyon Desert Golf Course expanded from a relaxed nine-hole course to a championship model in 2001. Its local field designers listened to the symmetry of the elevated Land to the north of the original nine and responded with a daring reply – adding 13 expansion holes and renovating 5 existing ones. The result is a striking blend of natural contrasts divided into the desert-dominated Canyon Nine, which delights in throwing the elements at an unwary golfer, and the more laid-back Grove Nine whose verdant fairways and greens welcome a long drive and a satisfying putt. There is no one word that describes Nk Mip Canyon Desert Golf Course in Oliver. Centuries before the course was created the Okanagan people who lived here had formed an affinity with the canyons, the game, the wind, and the water that nurtured their lives and added dimension to this region of the valley. They referred to the area as “Nk’Mip” (Inkameep) whose English meaning roughly translates as “flat bottom land at the mouth of the creek or river”. However the translation lacks the imagery of their language. The Okanagan saw land in terms of pictures that went deeper than words and when you see the Nk’Mip Canyon Desert Golf Course you will understand why. 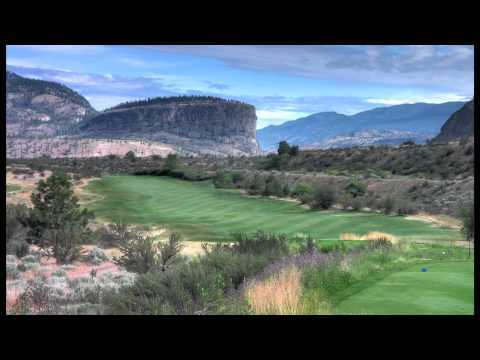 Owned and operated by the Osoyoos Indian Band, Nk Mip Canyon Desert Golf Course expanded from a relaxed nine-hole course to a championship model in 2001. Its local field designers listened to the symmetry of the elevated Land to the north of the original nine and responded with a daring reply – adding 13 expansion holes and renovating 5 existing ones. The result is a striking blend of natural contrasts divided into the desert- dominated Canyon Nine, which delights in throwing the elements at an unwary golfer, and the more laid-back Grove Nine whose verdant fairways and greens welcome a long drive and a satisfying putt. Come play through the spectacular vineyard, sage and stone vistas and watch the sun play tricks on the mountains. Environmentally sensitive areas all marked with green stakes, in order to protect the natural surroundings of plant and wild life. Very walkable golf course colf course designed for all levels of player ability. Thank you for the awesome Osoyoos golf holiday. The accommodation at the Watermark Resort with the lake view and two bedroom suite was first class. The Nk'mip and Osoyoos courses were challenging and scenic. We tried to stay on the fairways when we saw the rattlesnake warnings. We enjoyed the early tee times which gave us the afternoons to go for lunch and visit the wineries for wine-tasting. This was our first golf vacation and a great experience. Winning your package made it possible.We hope to return again.The vouchers made the check in at the venues very easy. Thanks again! This course was quite compressed with the front nine being tight in the middle of the fairways and difficult to play. The greens were extremely hard and dry, and one couldn't rely on any consistency between holes. The back nine opens up a bit but the wind is such a challenge that it almost feels like you're going backwards! Keep it low and straight. Overall nice GPS on the carts to help out. We went back to see if we could play it better the second time, and we didn't. Maybe Fairview is a better option for beginner to inter. golfers. We have played all the courses in the Southern Okanagan/ Osoyoos area of BC. My buddies and I think its the best value for the buck, except in summer as the hotels get way too expensive. We plan to return in 2012 and golfing Osoyoos Golf Club (Park Meadow) and the new Senora Dunes.